Want to have a group trivia contest on Skype? Microsoft announced updates to the bot functionality in Skype on Friday that let digital quizmasters and other automated participants take part in group text conversations. Developers that use the functionality can open their robotic conversation partners to groups of friends and coworkers, similar to what Slack offers today. Skype also now supports visual cards that let users see pictures, receipts and more, similar to what Facebook offers bot makers through tools for Messenger. It's all part of Microsoft's push to promote conversations as a computing platform. CEO Satya Nadella laid out the vision at its Build conference in March, describing a future in which intelligent assistants like Cortana work with special-purpose bots to help humans perform tasks like making hotel reservations and booking flights. 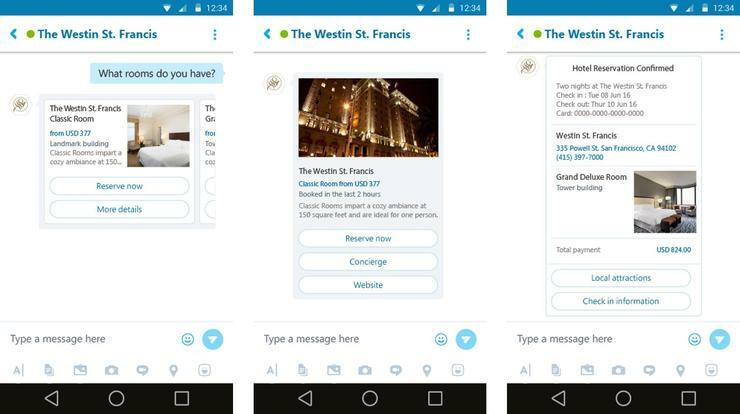 Developers building Skype bots can also now allow users to log into a service, like a hotel loyalty program, making it easier for them to keep interacting with a business without having to log in constantly. The Skype-specific news comes alongside updates to Microsoft's Bot Framework, a set of developer tools that make it easier for people to create conversational bots for Skype and other services. The Bot Framework is now better integrated with Skype so developers can automatically configure bots made with the platform to work on Skype, rarther than having to copy and paste configuration data. In addition, the Bot Framework supports new controls for developers, so it's easier for their bots to send messages that include clickable elements like cards and carousels. That's important as more messaging services allow bots to incorporate those rich elements, which make it easier for people to interact with them. Tech companies all over the place are taking part in a massive bot arms race. Facebook, Slack, Telegram, Google and a host of others all want to host the new bot invasion, since that could put them in a lucrative position, similar to where mobile app store owners are right now.